The Improvisator's artistry serves those in need! Keeping imagination alive in schools, helping to heal post traumatic stress, soothing the suffering of illness. See links to MEDIA COVERAGE at bottom of page. Through an unusual chain of chance circumstances, David Auerbach is now offering our impoverished schools, beleagered vets and ailing patients free music enjoyment programs designed to awaken creativity, dissolve stress and facilitate healing. This project is being underwritten by private individuals, businesses and foundations through tax-deductible contributions made to a nonprofit arts council, which is graciously overseeing the project as the artist's fiscal sponsor. When young people are bored in school, what sort of older people do they become? When soldiers return from combat, how can they find a life of peace? When people fall ill, can music help them cope and recover? David Auerbach offers, free to all, moments of pure enjoyment, healing and solace. Using the subtlety of sound to nourish the unwell and the injured. To discuss supporting the project, or to request services, phone (707) 224-4222. NOTE: David Auerbach gratefully acknowledges the project's original fiscal sponsor, the Arts Council of Napa Valley, which has had to reduce its activities due to staffing cuts.... thank you for having been there! Since July 15, 2012, the nonprofit fiscal sponsor of this project, everywhere, is the Solano County Arts Council. Healing assistance for post traumatic stress. For combat vets and other people with lingering suffering due to stressful experiences, rhythmic sound that targets the low frequency range of hearing can have profoundly relaxing effects. Drum playing in a supportive group does this. A gentle and steady rhythm shared around a single, large, community drum provides a heartbeat of safety, and this may be augmented with individual solo drums and other instruments for participants to express their individual feelings. As people become accustomed to the exercise, vocal recitation and creative movement are gradually introduced, with an emphasis on freedom and spontaneity. One net result over time is that the repressed memories and emotions become more accessible for therapy, and the rigidity of defensive brain patterns and body tension lessens. The pulse and breath rhythm is the innate connection to life. yet participatory rhythm immersion reactivates mental self-healing. Salutory sounds for the soothing of illness. Music's ability to reduce pain sensitivity and to speed recovery are finally being taken more seriously by modern science. It's about time. Different wavelengths of sound appear to have different effects on us. Ancient cultures have known about this for thousands of years! We all know that unpleasant sounds make us tense and pleasing ones quiet our thinking and relax our bodies. The right kinds of sounds accelerate healing when we are sick or injured, by raising spirits, lowering pain, improving rest and sleep. It takes no effort to get the benefits; just listening delivers them. That's because a happier and more relaxed brain does a better job of regulating the body's processes. Unique among arts, music produces many deep, direct physical responses. Music participation improves memory, balance, and coordination. Low frequency tones reduce pain predictably and measurably. Drumming boosts vitality more than exercise accounts for. Then singing brings their lost speech back again. And we don't yet know all its benefits. For further information about the role of music and sound in healing, the artist recommends the work and publications of these researchers, therapists and clinicians, among others: Concetta M. "Connie" Tomaino, DA, MT-BC (associate of Oliver Sacks, MD); John Burt, MCAT, MT-BC; Charles F. Butler, MD, PhD; Deforia Lane, PhD, MT-BC; Michael Thaut, PhD; Robert Lawrence Friedman, MA; Martha Burke, MS, MT-BC; Riina Raudsik, MD (Estonia); Tony Wigram, PhD (Denmark), Olav Skille (Norway); and the late Petri Lehikoinen (Finland). Their pioneering research confirms what thoughtful musicians have always known intuitively: that music has power to lessen and heal afflictions. Free music enjoyment for children. These participatory adventures combine music with other arts to encourage imagination, cooperation, and individual expression. Music, the universal language, is simply the artist's way of communicating love to young people. Students of all ages, backgrounds and personal circumstances derive benefit and enjoyment. The man in the feathered hat is big on fun. The young learn and grow through fun; without it they cannot. This artist is experienced at establishing rapport with severely emotionally disturbed and otherwise disadvantaged children. After-school enrichment programs are another specialty, with energetic activities that not only are creative but also relieve boredom and release pent-up energy. To a residency that engages an entire school's imagination! 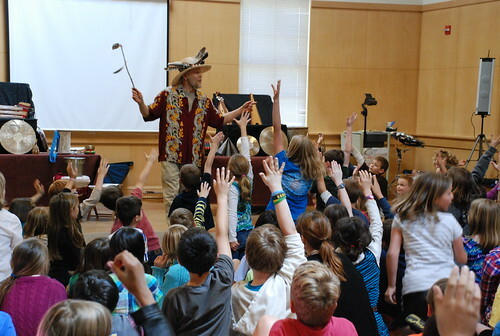 David's residencies have been a rousing success at elementary schools with as many as a thousand students! His "Tall Tale Conversations" story game transports students into the mind's playground. All that is required is a room with a couple of tables and space for a class to sit in a half circle. Several groups per day can each have a turn at the exercise, which lasts about an hour. 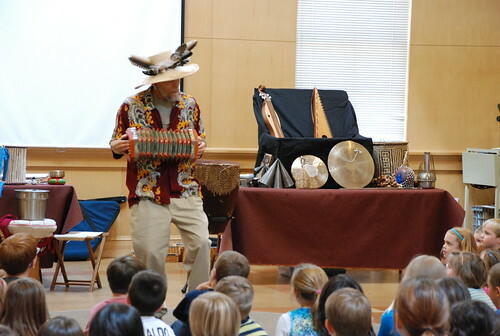 The artist uses as many as three dozen world instruments to facilitate and enhance a fantasy story which the children themselves make up together. Each child invents a piece of the story and gets to be the musician's boss, picking the instrument he plays to illustrate the story with sound. Depending on age, students may also use acting, dancing, drawing and vocal or instrumental improvising to illustrate each other's story lines. 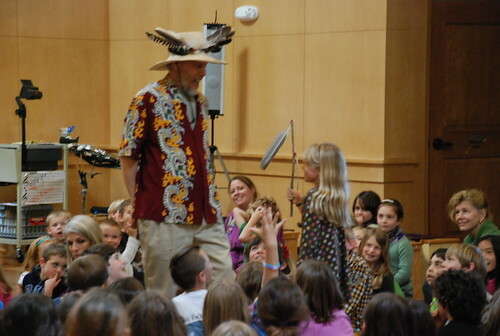 Multi-day whole school residencies end with assembly shows featuring other instruments, bringing the total to about fifty unusual international sounds that even most adults have never experienced! For older students (4th grade and up) the added element of improv acting has proven to be wildly popular, doubling the fun, as everyone gets to do both storytelling and acting. In this fast-moving, dynamic exercise, the results are frequently hilarious as class members challenge and top one another's creativity. Sometimes students collaborate to craft group ensemble scenes. All the while, The Improvisator provides a fluid musical mood, moving from instrument to instrument as he matches sounds to the mental gymnastics of the storytellers and the physicality of the actors. with participation pro-rated at just $15 per child. Even without outside grants, a school's own PTA can make it happen. "Tall Tale Conversations" story games are also a natural fit for fine and performing arts classes. The Improvisator's students practice spontaneity within their chosen elective arts: using improv acting in drama classes, free form movement in dance classes, lightning drawing in fine arts classes, and instrumental or vocal improvisation in band and choir. This encourages being in the moment, doing art for its own sake, and loosening up the creative spirit in each young artist. Youth's sensitive life issues can also be comfortably, playfully explored in the process. "Sound Explorations" are particularly well suited for teens. These workshops use instruments to investigate nonverbal communication and rhythm. A school's own band or percussion instruments may be employed, or the artist can bring his own extensive array of international drums and shakers. Drumming harmonizes mind and body, and melodic instruments and voices can also become exploratory. Every person may learn to shine as a valued part of the interwoven whole community, and to support the contributions of fellow players. Other expressive arts may be blended into the exercise along with the music, depending upon the group's learning pace. Napa Valley Register story, November 9, 2010 Written by City Editor Kevin Courtney of the Napa Valley Register. ABC-7 television story December 8, 2010 Sensitively produced by veteran reporter Don Sanchez of ABC7. Fairfield Daily Republic story October 16, 2011 Written by Amy Maginnis-Honey of the Fairfield Daily Republic. Vacaville Reporter story October 15, 2011 Written by Richard Bammer of the Vacaville Reporter. Details for educators and "venture humanist" sponsors are available on request. Get in touch, and together we'll make it happen!